After fretting over a recipe to make for St. Patrick’s Day and then having a few gluten-free/vegan cakes crash and burn, Eric suggested that I switch things up and make pesto. It’s green, right? He was onto something, that clever man. I peered into the fridge and found zucchini, avocado, and spinach. Also green. They were also not growing fur which is always a miracle in this house. On the counter, green lentils and millet. I don’t really believe in fate, but this was the perfect combo for a healthy green dish! I’ve had a few requests to show you some of the meals I’m eating while on the allergy elimination diet. It was rough at first and I had no idea what to eat for a while. It’s getting easier though and I’m determined not to let this challenge translate into boring, bland meals. Last week’s recipe was an example and so is this dish today. Let’s hope I can keep this enthusiasm going! This isn’t actually “pesto” per say since it’s nut-free, but it’s close enough. I adapted my beloved creamy avocado dressing for this one. It’s a simple blend of avocado, basil, extra virgin olive oil, lemon, sea salt, and garlic. The dressing has a nice zip to it, kicking up the dish several notches which is always a good thing when cooking with millet. I like it in generous supply on my plate as you can probably see! 2. At the same time, cook the millet. 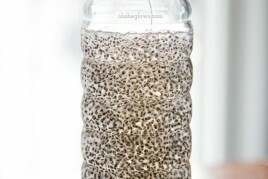 Rinse and drain in a fine mesh sieve and add to a medium pot. Add 2 cups of water or vegetable broth, bring to a low boil, and reduce heat to low-medium. Cover with tight fitting lid and simmer for about 20-25 minutes or until the water has been absorbed. Remove from heat and leave lid on to steam for another 5 minutes. Fluff with a fork. 3. Meanwhile, sauté the zucchini in a skillet with a bit of oil, salt, and pepper for about 5-10 minutes, or until much of the water has cooked off. Add a few handfuls of spinach into the skillet and cook until wilted. 5. To assemble: Toss the millet and lentils together in one pot and season with Herbamare and pepper. Portion onto plates followed by the zucchini and spinach mixture. Now spoon on a generous amount of dressing and serve! 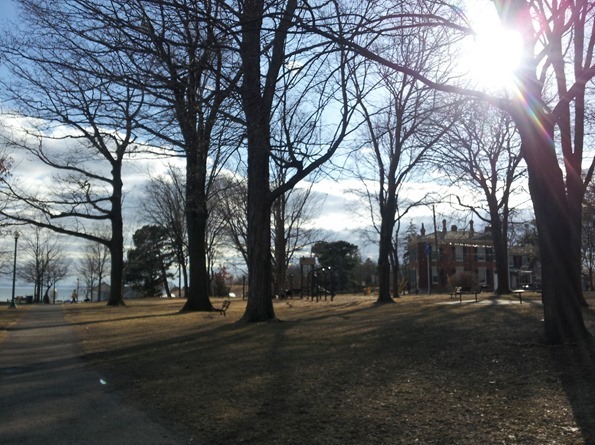 Three cheers for a gorgeous spring-like weekend, long walks, and an extra hour of photography day light! I don’t know about you, but I have full blown spring fever. PS- Keep those entries for the VVC giveaway coming in. I’m happy to see how many of you are in the area or within driving distance. lol. I just literally laughed out loud when I read the part where you talked about how it’s a miracle in your house when fur is not growing on food. I know what you mean! I have been wondering what to do for St. Patrick’s Day this year and here you go and solve all of my problems for me. Thanks so much! Oh man, I could talk your ear off about blogging! hah. Is there anything you have questions about specifically? Hey Meredith, I just wanted to let you know I didn’t forget about your question! I’m just giving it some more thought as I need to remember what I used when I started. :) Will get back to you shortly! I love millet – it has such a great texture. Must do buy some more. I also love the idea of mixing avocado with basil for a creamy pesto! I did some a couple of weeks ago but used Greek to cream it up. Great vegan option! This is so full of lovely green goodness! Yum! Yum. I love very little in the Spring more than fresh pesto, can’t wait to make this. Such a delicious twist on an old classic! Wow this looks awesome! Love the idea of a pesto dressing. And as the Irish aren’t known for their healthy vegan cuisine, I think a St. Paddy’s-themed salad is alllllways a good thing! I meant sun setting later. See what losing an hour does to me? This certainly does look like a powerhouse meal! I love millet and I’ve been making a lot of avocado/basil cream sauce. That stuff is good on anything! I definitely can feel Spring coming around here, it was 60 degrees for my half-marathon yesterday. Perfect running temperature! I feel stronger just looking at this pretty plate! Oh my goodness! I am also doing the allergy elimination challenge, except for sensitivities rather than allergies. And guess what’s on my elimination list? Avocados! (As well as tea, cinnamon, mushrooms, spinach, oregano, rye, barley, to name a few). So I won’t be able to try this for 3 more weeks. And I know what you mean about not knowing what to eat — the first few days I had no idea what to eat and lost 2 lbs. So I had to look at my list of “sensitive foods” and realize that anything NOT on that list was OK! That has helped a lot. Good luck with yours, and let us know how it goes. This looks scrumptious, as always! So much green! So much deliciousness! OMG! This looks AMAZING!!! I want to stuff my face into the picture on my screen. I really like this recipe, simple but healthy and satisfying. You can never go wrong with avocado. I love avocado, I think it goes great with everything! I will have to give this recipe a try, thanks. If I may suggest a twist, you can add lime juice – It’s wonderful with avocado. [ Smiles ] “Green Powerhouse;” I LOVE the sound of that! Thank you for posting another great recipe! I saw a couple mentions of elimination diets – are you both following a specific one (like Conscious Cleanse, or something along those lines) or is it something that you developed yourself or your health practitioner? I’m asking as I am interested in doing one myself, but am in need of more info. Thx! Jennifer: In working with a sports dietitian, we did some bloodwork to identify food sensitivities, so I am eliminating the things that showed up. I’m 10 days into a 28-day challenge, and I’m already noticing a difference in how I feel. Some of the things that showed up for me were things I ate/drank every day, like tea and cinnamon. Other things I ate often, but not daily. So green! Love it – I am such a fan of pesto but it gets boring if you have the same type all the time, so I love finding new variations :). Oh my my! I’ve been making this pesto that’s heavy on Italian Parsley and it’s been amazing. I’ll definitely try adding avos to it for a creamy alternative. Thank you! Such a vibrant, healthy, and green looking gorgeous salad! Sorry about your vegan baking cake fails. I had a couple caketastrophes last week as well…ugh, hate it when that happens! Happy St Paddy’s Day with all this green going on! Hi Angela, Do you use a specific site to build recipes and produce nutrional facts? I am on a specific meal plan, and want to see how it changes the nut facts if i alter something… Thank you! Absolutely gorgeous!! Millet is on my favourite grains by far. Have to recreate this one! Wow! That looks so fresh test filling at the same time. I know whats in my next shopping list! This looks amazing! Hello, tomorrow’s dinner! Ooh yes, you are speaking to a pesto addict over here (and a recently-turned avocado lover too!) This sounds delicious Ange, and I would have never thought to make pesto with avocado but that’s a genius idea! 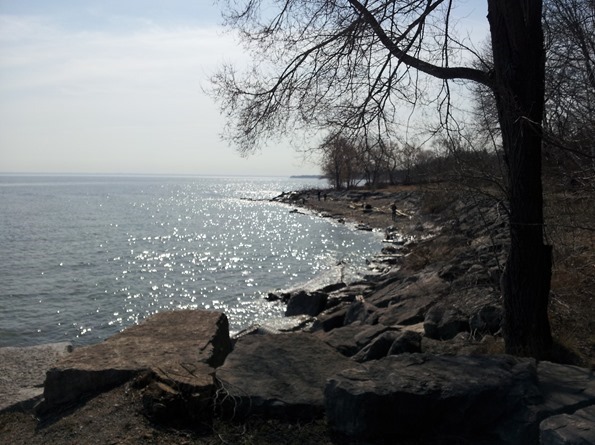 I agree with you on the sunny weekends – this past one was gorgeous!! Hopefully all of our snow and rain disappears soon! Oh. My. Word. This looks right up my alley! The “pesto,” spinach and lentils combination sounds delicious! This recipe is happening in my kitchen this week. Thanks Angela! What a pretty looking dish! Very appropriate for St. Patrick’s Day :) I’m a huge fan of avocado, so I pretty much love anything that features avocado. This is so similar to one of my recent faves in the last two weeks. 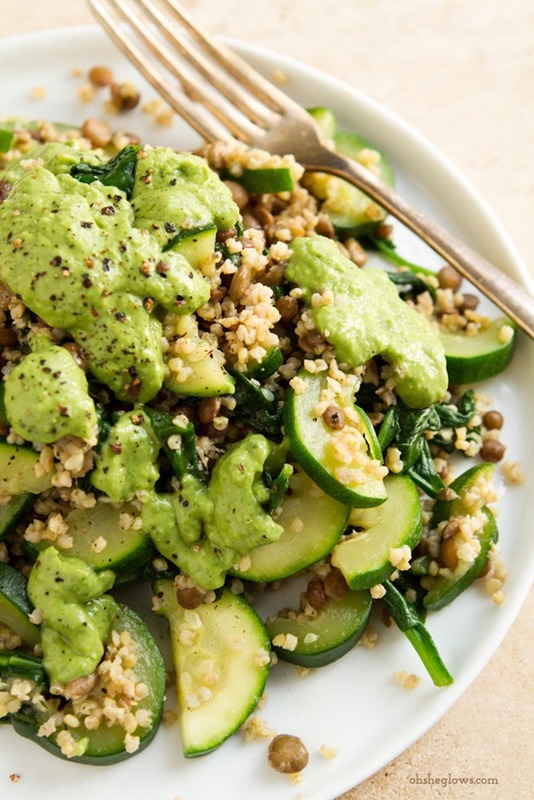 Lots of greens, plus grains and avocado topped with pesto from Trader Joe’s. I will definitely have to try to make my own soon! This looks delicious! I always look forward to seeing your recipes and how you continue to incorporate more and more veggies and good food! Thanks for posting this recipe! I’m doing an elimination diet as my breastfeeding baby has several allergies. I’ve eliminated dairy, eggs, soy, peanuts, and chocolate. I made this delicious recipe for dinner tonight. I added shiitake mushrooms to the zucchini and replaced the basil with dill. The pesto tasted super fresh and fabulous! Thanks for the dinner inspiration! This looks absolutely delicious! 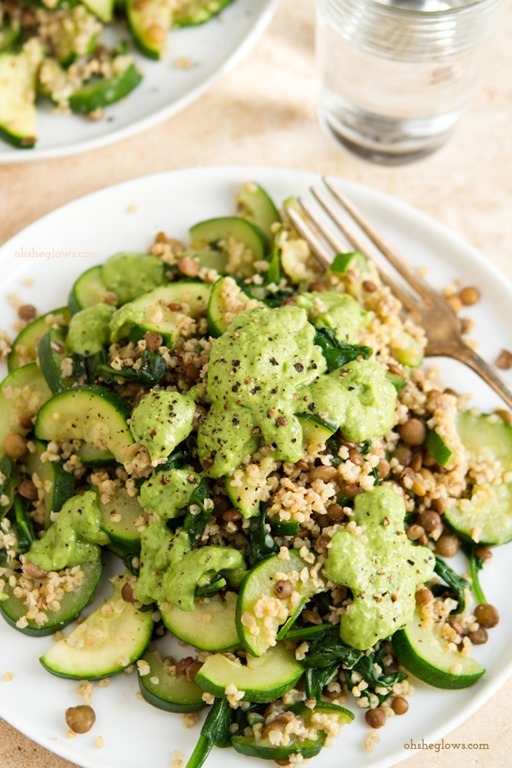 Zuchinni and pesto are two of my favorite green things so i can’t wait to try this recipe. I pinned it to make for lunch next week! I read often yet never comment- i just wanted to say thank you for posting a never ending supply of delicious healthy vegan meals that are actual meals! I find so many vegan recipes on the internet are flimsy salady things that are 200 cal “meals” or raw desserts that are all nuts! Your blog is always inspiring and i have referred many many omni friends here to see how delightful cruelty free is. I just love the simplicity of this dish! Sometimes the best recipes are the ones you throw together with the “non-furry” veggies you have on hand! :) Can’t wait to try the pesto, thank you! I just made this tonight and we (husband and I) LOVED it. Will definitely make it again. I subbed couscous for millet since I had none, and it turned out fabulous. Am off to recommend to someone who has been transitioning to a vegan diet and is having a hard time finding really tasty dinners. Thanks! I could bathe in pesto…it’s so yummy! I won’t of course but still. I just made this for my lunch and as it was only for 1 i only made a small amount. What a huge mistake! It’s delicious and now I want more. The avocado is a nice change for the pesto. I didn’t have any millet but ill definitely pick some up for the next time. Thanks Angela. I’m so happy you enjoyed it Maritza! I was also trying to find a good St.Patty’s Day recipe and I decided on pesto as well! Mine is a pesto salmon recipe though. 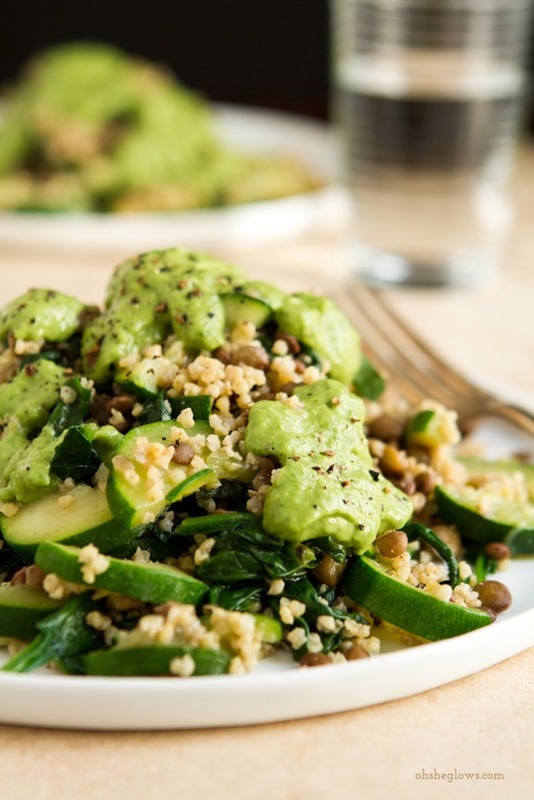 I like the idea of a warm pesto millet salad! This looks really good! I love the idea of a green recipe that’s not just green beer (which is typically what all of my friends do for St. Patty’s Day). I will definitely be making this. This is brilliant. I was struggling with energy/fatigue a few weeks ago, and made a commitment to eating green things in LARGE quantities, plus other high iron sources. The result was, in fact, more energy and focus. But, after awhile, there are just so many broccoli, spinach and kale concoctions one can come up with. I look forward to trying this! This looks great! Sounds like a great meal to get me ready for Spring Break travels. What a creative recipe, can’t wait to try this! Simple and nutritious. And you definitely take the most amazing pictures. I would love to learn some tricks and tips on how you take such vibrant pictures. This is just fabulous. I love adding spinach to pesto– it’s already green, so might as well pack it with more nutrition! I will be in San Francisco in a month and need some good vegan restaurant ideas. LOVE your blog it’s my favorite!!!! Made this last night and added crimini mushrooms and Brussels sprouts. YUM. I love millet, avocados, basil, zucchini and spinach. I must make this! Millet has become my new favorite grain, such a good texture and forms easy for veggie burger making. Elimination/allergy diets are so hard! I’ve done them twice now, it gets easier as time goes on. Plus you usually feel more energetic and less bloated by eliminating sugars and gluten. Hope you feel better and figure out what you may be allergic to. Good luck! This looks incredible! I love the nut-free pesto improvisation, and all that green just makes me happy. I know what you mean regarding not knowing what to eat — when my dad and I found out that we have celiac, neither one of us knew what we could eat. I wound up going to Whole Foods and begging for help while wandering the aisles; it wasn’t my proudest moment, but it was really helpful. :) Hope your elimination diet is going well and that you’re feeling good! I cant wait to try this! Thank you for sharing this recipe. My husband and I just made pesto this Sunday (the traditional way)! This looks amazing though for a GF/vegan pesto! YUMMY!!!! This looks so super tasty – I will be making it this weekend for sure! This was delicious! I made it for the family tonight. :D I added sugar snap peas in addition to the spinach and zucchini. I also subbed bulgur for the millet because I couldn’t find any in my cupboard. I had to use dried basil because none of the grocery stores in the area had fresh basil. I will definitely make this again! YUM! This looks delicious! How long do you think the dressing will hold up? I was thinking about making the recipe for multiple lunches next week. I would imagine it should last at least 2 days. The avocado might throw it off quicker than normal though. goodluck! This looks so delicious! I love the idea of using avocado in the pesto. I can’t wait to try this springy-looking dish. Have you ever thought of putting together weekly meal plans? What does a day in your life look like food wise? I’ve thought about it for sure – maybe something to think about when my book is finished! Thanks for the suggestion. Made this dish last night and it was a hit! “Good flavour”, “yum”, “send me that recipe” comments from the girls. Had to cook a second batch of the millet (good thing I bought too much) b/c it was ready in 15 minutes of cooking + the 5 minute set & steam. Keep an eye on it. Also added in celery, finely chopped and steamed baby kale, and steamed broccoli for the most greenest of meals I could make. Subbed four olives instead of oil in the dressing, and 2 tbsp olive brine for the water. . I wanted a thick sauce. Made this recipe today. It was perfect for St. Patrick’s day! My guys gobbled it up. Even my teenage boys loved it. The pesto is divine; i did sube the zucchini for broccoli. This dish has me thinking I will experiment with other veggies and grains. Thanks for this versatile and easy entree. This is one you can almost do without a recipe… Clean up the fridge with. Love those! This is my favorite kind of dish, Angela! Tons of green, loads of flavor. Looks fantastic. I made this last night for my husband and 1 year old son and it was amazing! We are not vegan but we are incorporating more vegetarian and vegan meals into our diet these days for a variety of reasons and i think this one is going to be a staple. Num! Loved this recipe!! I made mine with ol’ brown lentils and brown rice pasta (that’s all I had on hand), added mushrooms to the saute (they were in bad need of being used) and threw in a ton of garlic for the sauce (my cubemates at the office are gonna HATE me tomorrow)! This is a definite keeper. I even abstained from eating out of the pot (mostly) so that I could sit down, eat it slow and really enjoy it. Kind of hard since I was coming down off of a heavy workout, but so worth it! Tons of leftovers, too. Thanks for an awesome twist on pesto! I am currently going gluten free and have been looking for recipes. A lot of them can be a bit bland but this looks incredible. I will be making this tomorrow. YUM. Made this today. Thanks for reintroducing me to millet. Don’t think I’ve had that stuff since i was like 8. Yes Im sure that would work great, enjoy! I’m also on an elimination diet of sorts. After eliminating all top 8 (top 5 I guess for us vegans! ), my breast fed son’s GI specialist recommended I eliminate avocado too. Sure enough, it did the trick for him! I had no idea avo was a high allergen/ irritant. 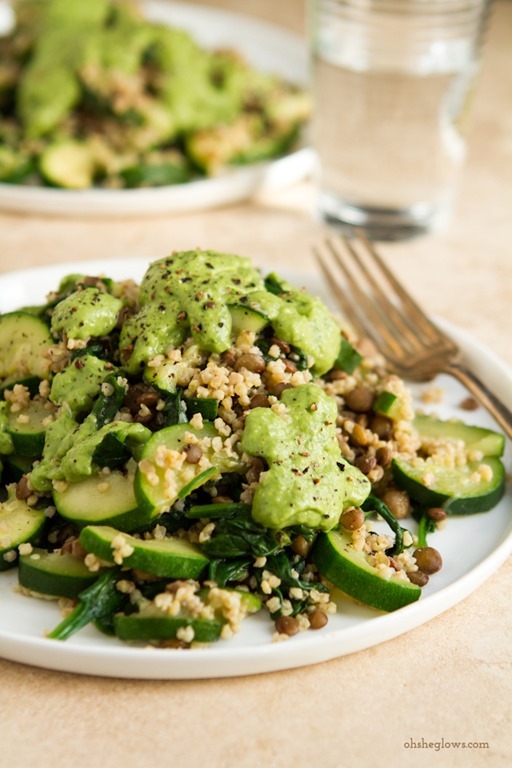 Anyway, this recipe looks delish, and just wanted to pass along our experience with avo in case you don’t get the results you’re hoping for on your current elim diet! Good luck! Thank you for the tip Jamie! I have since re-added avocado back into my diet (it was a suspected food) and thankfully no troubles that I’ve seen so far (whew). I still don’t know what caused it! I may never know I guess…hah. I have had this great dish 2 days straight. And my 17 year old cleaned his plate!! Now, I am looking at those Raspberry Thumbprint Macaroons with excitement for the upcoming Easter weekend! Wowzer!! I had the same experience as Tania – clean plate club all the way around with this delicious dish! I made another batch just for myself and had it for lunch all week. Seemed like the pesto lasted fine too. I made this dish tonight and it was awesome! =) I didn’t put the lentils in it though… We aren’t a big fan of them so I just did 2 cups of the millet cooked in broth and it was wonderful. Thanks! This was last night’s dinner and we both enjoyed it! Boyfriend didn’t even say “would be better with chicken” like usual :) My only substitution was to replace millet with quinoa. Next time I want to add chopped sundried tomatoes — even though it ruins the green theme. The dressing/sauce was fantastic. Thanks for another healthy, satisfying recipe. I made this dish last night and it was a hit with my family! I always turn to your blog when I need something new. This is my new favorite recipe!!! THANK YOU for helping me be healthy!!! My husband made this for us a few nights ago for the first time. I was really skeptical about it because I had never eaten anything like it before. It is now one of my absolute favorite meals. I really couldn’t believe how good it was. Thanks for the recipe! We have three boys, ages 9 and 6 (twins). All of them devoured this dish, and that is quite an accomplishment! My oldest said that most kids would take one look and say “No way!” but that they would really be missing out. Dishes like this have helped my children overcome the hangup that many kids have with seeing more than one ingredient mixed together in a dish. We make a lot of your recipes, and my husband and I think they’ve all been “keepers”….. It is all so delicious! This recipe looks amazing, as all your recipes do. Just wondering what I could substitute the avocado with, if anything? I love avocado, but unfortunately it gives me the worst stomach pains! I dont know of anything off the top of my head, but if I think of anything I will let you know! This is solid gold! I’m in love with millet from the beginning. Millet flour, teff pancakes, here I come! what could we substitute the avocado with to make it creamier ? :) I am making this this week. We are trying to add more avocados to our diet. They are packed with nutrition and they are great for fertility. However, I lack creativity with avocados and they usually end up..mushy because I neglect to eat them. Thanks for a great recipe! Just wanted to drop in and say thanks for posting such an amazing recipe! I have made this so many times, always to huge compliments from whoever tastes it! It has definitely become one of my go-to super green weekly dishes. Thanks for all the inspiration, your ideas really touch others, even as far as here in South Africa (where I stay and where there is little vegan inspiration). My daughter and I had this for dinner tonight. Oh my gosh, it was amazing. I didn’t have any millet in the house so I used barley. This is definitely one of my new favorites. The dressing is to die for. Thanks! What a fantastic looking recipe. And way better for St. Patrick’s day than green dye in lo quality beer! I made this dish last night; my boyfriend and I loved it. I was super excited to get leftovers for lunch. I think that the avocado pesto was phenomenal. Thanks for this recipe! I really want to make this. But, everytime I try I’m missing an ingredient. Darn. I’ll succeed one day. I love your site! I reference it all the time for ideas. We needed to get back on track after a week of beach vacation eating and this *exactly* what we needed. I just made this and the taste is great! But I was wondering, the sauce is that yucky brown color and I only made it about 10 minutes ago. Is there anything I can do to avoid that in the future? Thanks so much! I made this for St. Patrick’s Day instead if the ol’ traditional Corned Beef and cabbage. I have turned completely vegan for health reasons and am loving it 100%. Especially Angela’s recipes. This one was so easy and tasted so so so good! I used vegetable broth in the millet and I think I added to much because it was a bit mushy. So next time I am going to use water and less of it. It was still fine though. I think next time I want to add mushrooms to the zucchini and spinach. 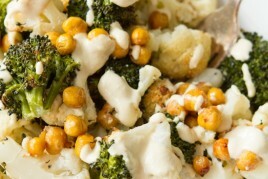 This recipe can totally be modified with whatever veggies you like. The pesto was my favorite part!! Super easy to make. I put a little more garlic because my fiancé and I love garlic. I will make this again and again. Thank you so much Angela! This was amazing and simple to make! I added a sprig of fresh thyme and rosemary to the water for cooking the lentils. Then I used the liquid (2 T) from cooking the lentils to put in pesto. We also added some sauteed onions. Didn’t put any oil in pesto and just drizzled some over the top of lentil/rice/veg before adding pesto. We will be making this tasty meal again…thanks! Oh my goodness! So in love with the few recipes I have been introduced to so far! I am asking for your cookbook for Christmas. In the meantime, could you suggest a substitute for the avocado in this pesto? I am anaphylactic to avocado, but also realise that sometimes it is the texture and fat in this fruit that makes the recipe. Thanks in advance! Yes, I think quinoa would be lovely! This was delicious! My first time cooking with millet and the sauce is addicting. Will be a repeat. 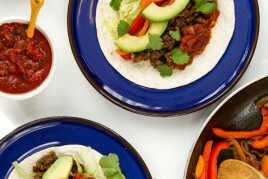 Previous post: Vida Vegan Con Giveaway!